Last week I wasn't feeling too grand on Tuesday so I didn't go to Barnsley Archives to carry on transcribing the pub inventories from the 1840s that I've been working on for the past few weeks. This morning I've woken with stomach pains at 5am so today is a bit dubious too - hopefully I'll be feeling a bit better by 9:30am, the time I usually go out for the bus into town. Today should have been my ATOS appointment ... however they cancelled it last week, with less than a week's notice. No real information in the letter, just a comment that the cancellation was due to unforeseen circumstances ... again. This is now the second time they've cancelled my interview. Not that I'm looking forward to it, you must understand ... my health varies so much from day to day and week to week that it's totally luck of the draw whether on a particular day I'm fine, not too bad, or stuck in bed. As the ATOS 'medical professionals' seem particularly poor at understanding hidden and variable illnesses the chances of coming out labelled 'fit for work' seem quite high if I turn up on one of my good days. The other factor is that in the last few months I've got much better at pacing myself - I can usually manage two to three hours in the Archives before the brain fog descends and I find myself typing nonsense into the transcriptions I'm doing. I did prove to myself these last two weekends (as I frequently have to as I would honestly much rather be fit and well and I keep trying to live normally) that doing too much (usually what anyone else would consider an ordinary day) just ends up with me taking a day in bed to recover. So that was a day in bed after the Oral History event a the weekend before last (hence missing the Archives last week) and a day in bed yesterday after my first Open University tutorial in Leeds this weekend. Ho, hum. The Star Inn was on Church Street opposite the site of the war memorial in front of the town hall. You will see it in this map snip (from the Old Maps website) to the top of the image just above Star Lane. The whole of the block where the Star is was swept away in the late 1870s to connect Regent Street up to Church Street (which runs top to bottom in the map snip). The Star Inn was much larger than the Turf Tavern which can also be seen on this snip, but not quite as big as the Royal Hotel lower down Church Street (still in existence, but now known as the White Bear). In Barnsley Streets Vol 1 there is a picture on page 22, a drawing only, looking from Regent Street up Star Lane towards the pub. I suppose it has been drawn using the available evidence, the maps and surviving photographs of the rest of the street. There are no other pictures that I have yet found of this pub. The listing in Barnsley Streets traces the pub back to at least 1777 when it was occupied by Wm Leadman, presumably the father of the John Leadman whose name appears on the inventory I am transcribing which is dated 1841. The inscription for John Leadman, late Inn Keeper from his gravestone in St Mary's Barnsley churchyard. John and his parents are buried in St Mary's churchyard. This is the transcription of their gravestone that I found in Barnsley Archives. Barnsley Streets also notes that the occupant in 1818 was Martha Parker - this must be William Leadman's wife who remarries after his death to John Parker. John Leadman runs the pub from 1822 to 1845. This is confirmed by the above cutting from the Leeds Times in 1839 announcing the marriage of Jane Leadman, second daughter of Mr John Leadman butcher and landlord of the Star Inn, Barnsley to Mr Robert Cook, a warehouseman. The pages for Church Street are damaged in 1851 and I cannot find the family in the indices on Ancestry suggesting they might appear in the damaged section. There is another family of Leadmans - Joseph and Jane Leadman - also having children baptised at St Mary's around the same time as John and Ann. As Joseph is also a Butcher maybe he is John's brother? This part of the family appears to move to Wakefield and Leeds after Joseph's death. 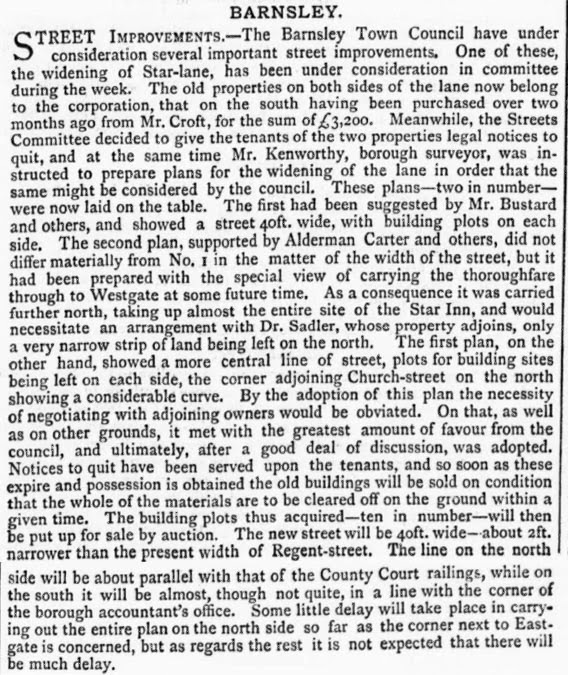 By 1861 the Star Inn is occupied by Charles Kilner - Barnsley Streets records another landlord, John Puley, inbetween the Leadmans and the Kilners, information which I presume Edward Tasker found in local trade directories. Note that at this point the Star Inn is number 8 Church Street. 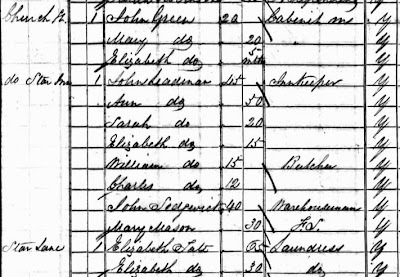 I've been using Find My Past to search for these census returns as that site allows you to search by address - something you can't yet do on most of the census years on Ancestry. Note that in 1871 the Star Inn is not named, but identified by the landlord James Kilner, is at number 17 Church Street. Some renumbering has gone on! 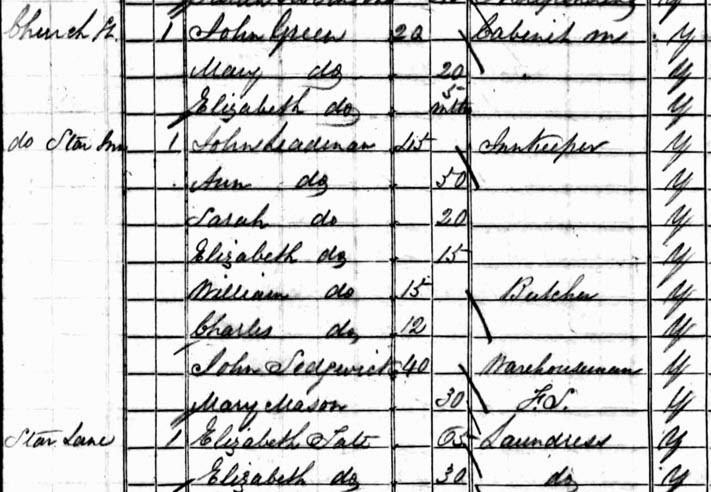 The property enumerated next on the census is number 21 (what happened to 19?) and is occupied by Dr Michael Sadler. Through my Open Uni registration I have access to an assortment of subscriptions to historic newspapers and periodicals - I found the item above from the British Architect magazine when I should have been looking for information on the outbreak of the First World War ... tsk, tsk!! "Barnsley Council have under consideration several important street improvements. One of these, the widening of Star Lane has been under consideration in committee during the week." The article goes on to compare the relative merits of two plans for opening out Star Lane. Although it only mentions the site of the Star Inn in connection with the second plan, there seems no doubt, looking at the map, that any plan to widen this street would involve its demolition. The article mentions that "the old properties on both sides of the lane now belong to the Corporation" so a search in the newspapers for the sale of property might provide more information. 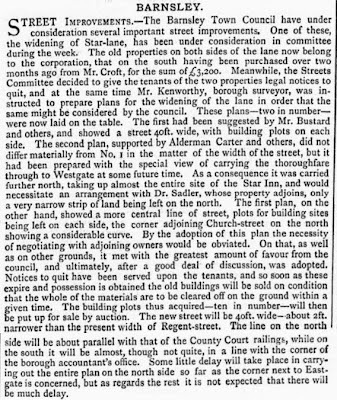 Barnsley Streets notes that James Kilner was the landlord of the Star Inn up to 1875 - so that narrows my search down to just a couple of years worth of Barnsley Chronicles. I wonder if the actual demolition made the papers? In the 1881 census the street numbers jump from number 7 - the Royal Hotel, and number 9 - a house occupied by Samuel Thickett a factory operative, straight to number 21 - Dr Sadler's house - suggesting there was a cleared space. In 1871 a family had lived at number 9, but it was listed as the Post Office at that time. As the building just above the Royal looks similar in both maps I suggest that Samuel Thickett was maybe acting as a caretaker? during the conversion of use of the building from Post Office to bank. The Post Office has moved in this map, dated 1889, to a new building around the back of the old and with a frontage onto the newly widened Regent Street. Comparing the 1850s map to the 1889 map the make up of the both the blocks of buildings on either side of the new widened Regent Street is quite different - I understand from Barnsley Streets that the large house remaining on the corner is Dr Sadler's house, as referred to in the article from the British Architect but even the shape of that doesn't quite match the building adjacent to the Star Inn on the older map. Did Dr Sadler decide to have an extension built on the side of his house (maybe a fancy entrance porch) once the extra space was available? Barnsley Streets Vol 4 has some pictures of the top of Regent Street including one on page 133 which tantalisingly shows the side of Dr Sadler's house pre its demolition in the 1920s to make way for the Barnsley Building Society now Raley's solictors. These pictures can also be seen on the Tasker Trust website by searching for Regent Street. There are some good pictures of the rebuilt Post Office on the opposite side of the street - that building is still there today opposite Merryweather's estate agents and recognisable by its double fancy porticos. I have one further piece of interesting information concerning the longevity of the Star Inn. The above newspaper snip was found when I was searching for the OH's 3x great grandfather Peter Duncan in the Find My Past newspaper collection (which is the same collection now available to search for free at Barnsley Archives under the British Newspaper Archive name). 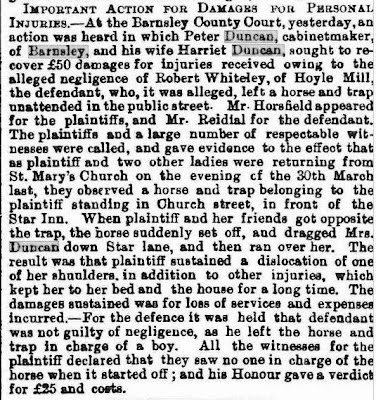 A horse and trap had been left apparently unattended outside the Star Inn in March 1876, and as Harriet Duncan (the OH's 3x great grandmother, maiden name Newsom) and her friends passed the horse "suddenly set off and dragged Mrs Duncan down Star Lane and then ran over her". Harriet would have been a matronly forty-seven years old at this point, mother to at least eight children, the last born in 1870. 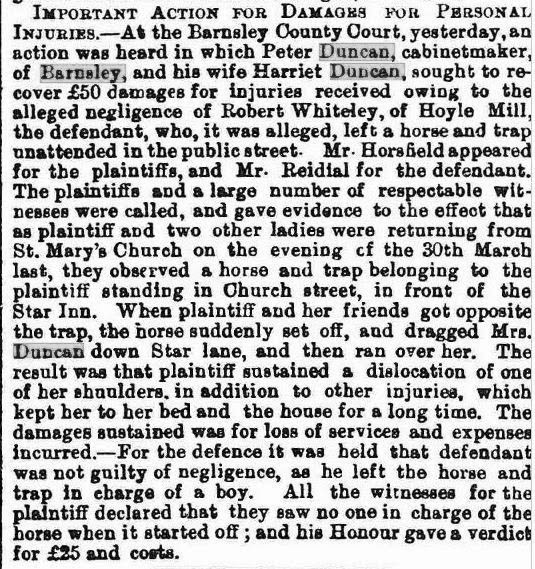 I can't imagine the accident was at all a nice experience and it looks like she was laid up for quite some time, so I'm not surprised they took the owner of the horse and trap, Robert Whiteley, to court. What the article doesn't say is where Mr Whiteley was during the incident ... had he popped into the Star Inn for a quick one? This has turned out to be quite a long article about the Star - and I am going to continue to try to find out what happened to the rest of the Leadman family and more about John's father William and his mother Martha if I can. I've still got that stomach ache, so I'll try a hot bath next and see if that perks me up! It doesn't feel as if I'm going to make the Archives today. Ah well, I get another chance on Thursday when I'm booked onto the digitised Barnsley Chronicle for an hour.